We are living in the fast lane. Nowadays we get what we need instantly; same day delivery, instant coffee, instant noodles, instant remedy for headaches and what not. To some hungry, grumbling bellies like mine, we need our seafood fix in an instant too! After a year of establishing Above Sea Level Restaurant, it has now grown into sixty-three franchises and seven owned branches with a total of seventy! Whew! It only shows how much Filipinos love sea food. 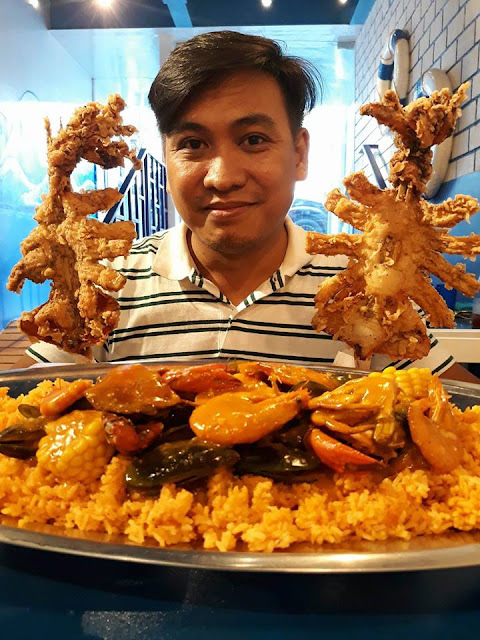 The clamor for a seafood fastfood resto is so evident that in Maginhawa street in Quezon City alone, there are two branches! Maginhawa street in Quezon City is considered as one of the top go-to places for a food trip around the metro. The sign outside is clearly visible even at night and the exterior is painted blue and white which is easy on the eyes and this color theme extends up to the ceiling, walls, floor, stairs, tables, and chairs inside. The entrance is PWD friendly since there is a ramp on one of the glass doors. There is ample seating for a party if you're planning to conduct one since the area is wide with plenty of seating. 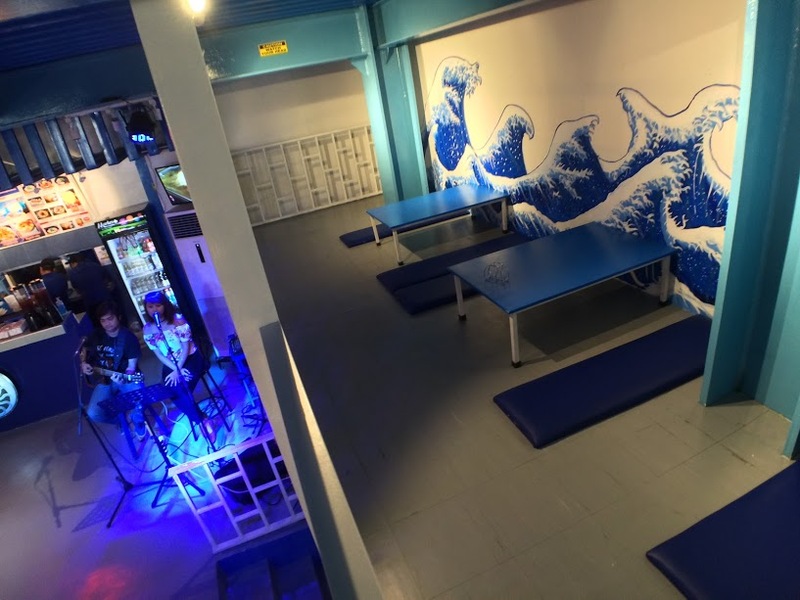 A mezzanine floor for Japanese style dining is on the right and to complement the ambiance, the walls are painted with Japanese style illustration of tsunami waves on the right and a gigantic sea creature on the left. They have thought of everything in this place. The restroom is "disguised" as a thinking room and the walls are decorated with lifebuoys to give the feeling of being inside a ship. The huge, eye-popping proportion of squid are available in different sizes for all kinds of appetite. The squid is so soft and tender that there's no need for a knife. It is presented creatively like a trophy to create the impression that you are rewarding yourself. They are famous for the Giant Butterfly squid and getting yourself one of these is a must. I've tried their Seafood Festival too which consists of mussels, shrimps, corn, and crabs. Pair it with beer and you'll have a grand time. The Squid fries is another story. The taste of the sauce still lingers in my mind. Food is served fast, there's no need to wait too long unless the place is packed. The staff is friendly and we were accommodated properly. The place is spacious, and the Japanese style dining at the mezzanine floor is an option for a unique style of dining. Overall the price is reasonable and since it's quite near my place, I'm definitely coming back for the squid.